Princess Cruises has announced that its latest ship will be named Majestic Princess and that it will be based in Shanghai, China, year-round. On order for delivery by summer 2017, Majestic Princess will be the first vessel from the cruise line built specifically for Chinese guests incorporating a blend of international and Chinese features. 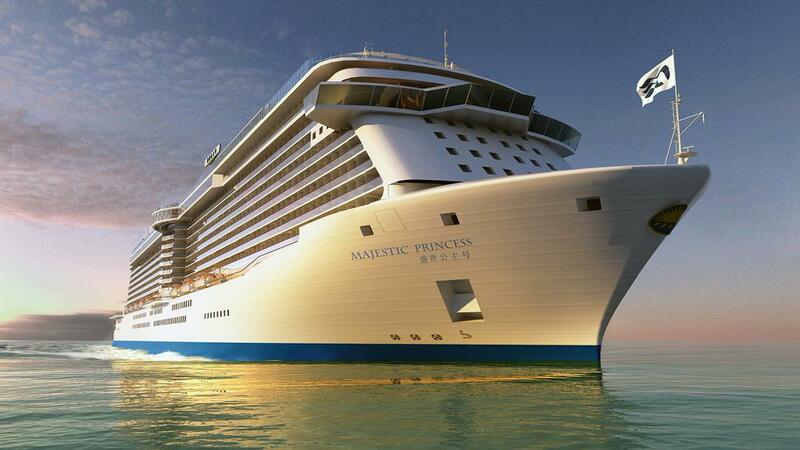 The 143,000 gross-ton Majestic Princess is being built at the Fincantieri shipyard in Monfalcone, Italy. She will be home-ported in Shanghai and will carry 3,560 guests on cruises to Japan and Korea. The vessel will offer many of the features that made Royal Princess and Regal Princess so distinctive including a dramatic multi-story atrium; the unique over-the-ocean SeaWalk – a glass-floor walkway extending 8 metres (28 feet) beyond the edge of the ship; the Princess Live! interactive studio; and the special Chef’s Table Lumiere, a private dining experience that surrounds guests in a curtain of light. Majestic Princess will offer a variety of international cuisine, with authentic dishes from Italy, France, North and South America, Southeast Asia, Japan and China. Guests will enjoy a festival celebrating dance, music and crafts of exotic cultures, an array of international guest entertainers, and Las Vegas-style production shows starring a cast of singers and dancers from around the world. As with all of Princess’ cruises in China, Majestic Princess will showcase the brand’s Princess Class experience, designed specifically for the Chinese market. These Princess Class enhancements enrich the travel experience of each cruise guest and include authentic, classic events like the World Leaders Dinner and Traditional English Afternoon Tea; special culinary experiences such as the Lobster Grill; Ultimate Balcony Dining, with an ocean-view hot pot dinner option; and an unparalleled duty-free shopping experience, featuring leading designer brands. The ship will also offer Princess’ signature Movies Under the Stars, with the largest outdoor screen at sea, and the exciting Princess Water Colour Fantasy fountain and light show. Cabins will be configured to appeal to families and multi-generational travellers and all outside staterooms will have private balconies. Many cruise lines are now tapping into the emerging Chinese cruise market. Recently Norwegian Cruise Line announced it was sending its next Breakaway Plus class ship to China, MSC Cruises will be sending MSC Lirica there, Royal Caribbean is sending Ovation of the Seas to China and Costa Cruises will be redeploying Costa Fortuna to the region next year.